Rescuers Matt Heap (left) and Matthew Johnson (right) with Mark Kerr who was rescued by the pair after he had crashed on the A19 in May. A school teacher was reunited for the first time with two men who saved his life by pulling him from his car moments before it burst into flames. Mark Kerr, 44, a deputy headteacher, almost died when he passed out at the wheel driving at 70mph and veered off the A19 at Dalton Piercy near Hartlepool in May. Matt Heap, 28, and Matthew Johnson, 24, who rescued Mark just seconds before his Vaxhall Vectra was engulfed by fire, have been presented with commendations for their bravery. They were came face to face with Mark who suffered a catalogue of injuries including to his head, chest and pelvis. Mark remembers nothing about the accident which happened as he was driving to work at Willowfields Primary School in Sunderland from his home in Billingham. Mark suffered multiple fractures to his head where he has been left with a large scar, and also to his pelvis, collar bone and sternum. He spent two and a half weeks in hospital before being allowed home to continue his rehabilitation. Mark hailed the support from colleagues at school and his previous school in Thornaby throughout his recovery. Mark thanked his rescuers as they picked up their awards at Cleveland Fire Brigade headquarters in Hartlepool – exactly 10 weeks since his accident – which he attended with wife Francesca and daughter Ellora. He added: “I can’t put into words what it means to me and my family. The word hero is often diminished by being branded about too much, but in this case it is absolutely true. Matt Heap, a former young firefighter, from Redcar, was just behind Mr Kerr in the outside lane of the A19 northbound when he saw the car veer off the road. He stopped immediately while his wife, Abby dialed 999. 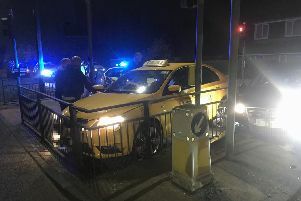 Matthew Johnson, also from Redcar, had been driving 200 metres in front of Mr Kerr and saw the accident in his rear view mirror before dashing to help. Mr Heap, a process operator with Sabic UK Petrochemicals UK, said: “When I got there with Matthew, the bonnet was smoking. He forced open the driver’s door and got his seat belt off and we dragged him out across the field well away from the car. Matthew, a worker with field service specialists Team Furmanite added: “There wasn’t that much time to think so we just did what we had to do. I have been to see Mark and his family and I know they are very grateful. I am very humbled to receive this award. Pictured talking to Cleveland Chief Fire Officer Ian Hayton (right) are l-r Matt Heap, Mark Kerr and Matthew Johnson at Ceveland Fire HQ, Hartlepool.